Are you actually looking to learn more about ladies black pants? Well, we hope you are because the reality is that you have found our page on the subject. 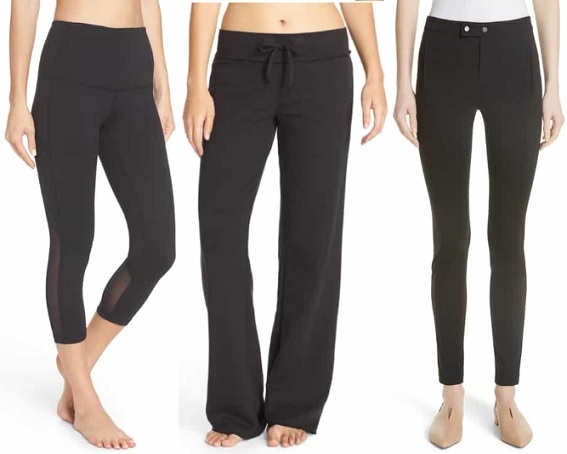 In this clothing section of the Apparel Search directory, you will find all sorts of interesting information regarding black color pants for women. Welcome to the worlds greatest guide to Women's Black Pants. Women's pants come in a wide assortment of fabrics, styles, and colors. One of the color options would be "black". Ladies black pants can be jeans, capris, cargo pants, dress pants, yoga pants, etc. In addition to color & fabric options, important options include pockets, cuffs, pleats, fly styles, etc. Black pants may be the perfect choice for your wardrobe. Bottoms for women come in a wide assortment of silhouettes. This type of garment can be worn for sport, casual settings, or formal occasions. Regardless if you are searching for fitness pants, dress pants, or casual attire, black pants have their place. This is a versatile color that can have a place in every women's wardrobe. The key is that you pair them with the proper tops, shoes, and accessories. Do you have a favorite color pant? Possibly black pants are your favorite. Apparel Search is a leading guide to fashion, style, clothing, glam and all things relevant to apparel. We hope that you find this women's black pant page to be helpful. You may also find interest in learning about fitness pants, leggings, yoga pants, sweat pants, compression shorts, etc. All of which can be produced with black fabrics.